How do I add a clock-in for an employee? If you need to add a clock in for one of your employees, you can edit their timesheet. Go to the Time Clock tab and find the correct date for the employee you wish to edit. 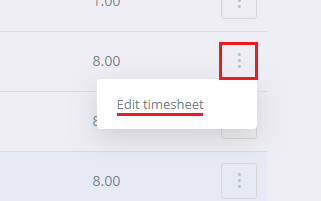 Click the options button (3 dots) at the right of the entry, and select Edit timesheet. Once you save your changes, the employee will see that they are clocked in from their Dashboard and can clock out from their shift as usual.